Our fun, hands-on learning sessions support the National Curriculum, deepen understanding of the natural world and encourage engagement with the diverse environment at Wild Place Project. The sessions have a strong focus on learning activities in the great outdoors, and take place in close proximity to animal enclosures to provide a truly immersive experience that brings the topic to life. Spending time in nature is widely accepted to have significant impacts on wellbeing, and can help to develop social skills, teamwork, resilience and self-esteem. Our experienced Learning Officers can adapt the sessions to meet your learning objectives. Guidelines for your risk assessment are available. Find out more by watching our schools and education video. With plenty of undercover areas for learning, picnicking and play, there’s no reason to delay your school trip until the summer. Our learning sessions focus on many of the ecosystems represented here at Wild Place Project, such as Madagascar and British Ancient Woodland. They take place in our beautiful woodlands, wildflower meadows or in one of our undercover schoolhouses. Take on a team challenge with Leap of Faith! The Leap of Faith experience offers a range of adrenaline-fuelled challenges to test the nerves of your school group. Including our namesake 25-metre Leap of Faith, Bristol’s only giant swing and a high ropes course, we certainly have enough activities to keep your students entertained and exhilarated! All activities encourage teamwork, promote self-confidence and help develop communication skills and resilience. We can cater to Key Stages 1 – 4 and tailor the day to meet your requirements and budget. You can find everything you need to know about your next school trip here! Come to Wild Place Project for a really wild teacher training day! We will provide lots of practical advice and ideas for taking the curriculum outdoors and using your school grounds creatively for learning. Talk to our team about what you are looking for, and how we can create a suitable training day for your group – you could even add on the Leap of Faith for the ultimate teambuilding challenge! If you are a teacher who is considering bringing a college, school or nursery group to Wild Place Project, why not join us for a free planning visit? To book your visit simply contact our bookings team today on 0117 428 5602 or email info@wildplace.org.uk. Please note we require at least 5 days notice to process a teacher planning visit request. Once you have booked an educaion session you can access a range of free teacher resources. These offer some great ideas for activities your students can get involved in, both before and after your visit, to enhance your Wild Place Project experience further. They also contain information about what to expect on the day of your visit. To take advantage of this fantastic offer simply book two education sessions within a 12 month period and you’ll receive a 10% discount off the price. Book in a visit in the spring as the woods and meadows come to life then return in autumn/winter to enjoy Wild Place Project in a whole new light! 10% discount applies for the same school visiting twice within 12 months. Discount will be applied at the time of the second visit. Total cost payable for both visits is £12.10 per pupil. One visit must be taken between 1st March and 31st October. Other visits must be taken between 1st November and 28th February. 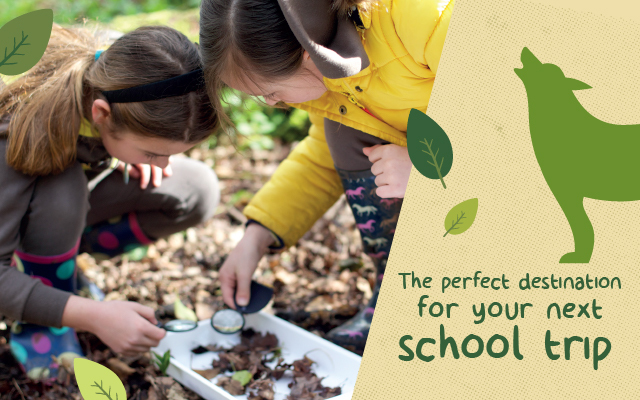 At a group rate of only £8.95 per child inclusive of an interactive learning session, Wild Place Project is the perfect fun, educational and great value school trip. Contact our bookings team today on 0117 428 5602 or email info@wildplace.org.uk for more information. To download our Education Brochure click here.